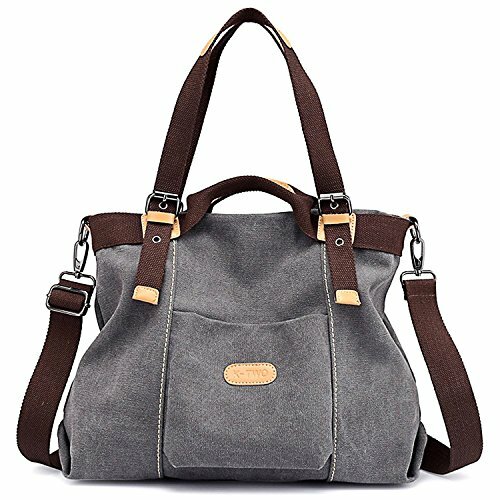 Multipurpose bags: shoulder bags/ cross body bags/ handbags for women shopping, work, school, travel, gym etc. External dimensions: 14.96"L×11.42"H×4.72"W. This women canvas handbags can hold laptop, A4 size book, cell phone, umbrella, various cosmetics etc. Overall design: Top zipper closure. Anti-theft back pocket. Convenient front pocket. Internal independent purse, cellphone pocket and zippered main compartment. Adjustable shoulder strap(detachable). Comfortable hand strap(detachable). Hardware connection. Main materials: Durable soft canvas. Polyester lining. High quality hardware and PU leather. Casual and fashion style: Whether it is commuting, shopping or dating, our canvas cross body bags always make you full of charm, and create a different sense of avant-garde fashion.